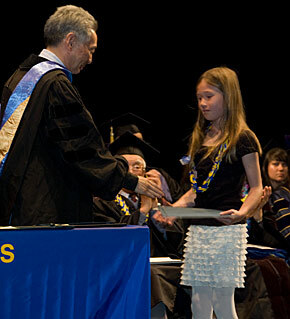 Elise Kiya, 10, accepts an honorary diploma on behalf of her grandfather, Seiji Kiya, who died in 1997. Bestowing the degree is ethnic studies professor Michael Omi. They were among 11 Japanese-Americans whose studies were cut short due to the internment to receive honorary diplomas — seven of them posthumously — at the Zellerbach Playhouse ceremony on Thursday. Degrees for those not at the ceremony were accepted by their family members, some of whom bowed and shed a few tears. Ten-year-old Elise Kiya accepted the degree on behalf of her grandfather, Seiji Kiya, who studied engineering at UC Berkeley in 1941. He died in 1997. More than 2,500 students of Japanese ancestry were enrolled at California community colleges and universities at the outbreak of World War II. Hori had been pursuing a graduate degree in engineering, and Kajiwara, undergraduate studies in social work.Their graduations inspired a standing ovation from the crowd. The bestowal of honorary degrees to Japanese-Americans whose studies in California were cut short following the Pearl Harbor attack and the subsequent executive order that forced more than 100,000 Americans of Japanese ancestry into detention camps is part of the California Nisei College Diploma Project, which was launched as a result of a California law in 2009.